MBA graduate turned Sarpanch, Chhavi Rajawat has been working towards transforming her impoverished ancestral village in the desert state of Rajasthan to meet the 21st Century. Chhavi Rajawat left her high paying corporate career with one of the country’s biggest telecom firms to become Sarpanch (head of the local governance system) and has been working ever since to bring better services to and building capacities in her ancestral village Soda. Soda is in a remote corner of Rajasthan where the houses are made of mud, electricity supplies erratic, literacy levels below 50 per cent and the fear of drought never far away. In this interview, she discusses her own inspiring journey, and the challenges to more women participating in government at all levels. From a corporate job to the working at the grassroots, how was the initial life change? Chhavi Rajawat: Moving from an organized sector to the most unorganized one hasn’t been easy but, it has totally been worth it. The change in career path happened because of the strong desire ofthe residents of Soda to appoint me as the Sarpanch. They provided me the opportunity to do something for my village and in turn something for our country. Development in remote rural areas not being visible in spite of the many well-meaning schemes reflects the fact that something is amiss. With my background, having worked in the corporate sector, I felt I could help bridge the gap between the village and the government as well as the corporate world and other agencies. I see myself as a ’facilitator’ trying to connect the dots in the hope of receiving support to create a model village, the development work of which could then be replicated to other villages. While my attempt may appear a mere drop in the ocean, it is all the drops put together that actually fill it. I believe, if each one of us chose to become ’responsible citizens’ of our country and contributed in whatever capacity, we could collectively change the face of rural India. We often fear failure but I believe we, instead of fearing the result, should at least make an attempt. It really is best to do so without contemplating what would be the outcome. 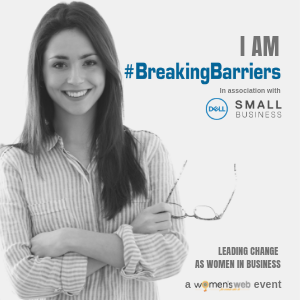 Are there any challenges you faced as a woman, stepping into a largely male dominated sector? Chhavi Rajawat: The post of Sarpanch, in my area, appears ornamental. There are neither powers nor funds that the Panchayat can use at its discretion; we are at the mercy of local government officials i.e. District level and below. If the individuals at the grassroots bureaucracy carry the vision, it translates into development on the ground; else, the rural remains hindered by the apathy and ego of the very folks who are employed to assist in that development. In that respect, I would not call it a gender issue but that of the system not recognizing and respecting Panchayats as it should. Within my village itself, I am at a clear advantage with all treating me as ’the daughter of Soda’. On the other hand, are there any advantages that you find yourself with, as a woman, or any issues of special interest to you? Chhavi Rajawat: Providing safe drinking water, sanitation, basic hygiene, better education, vocational training/providing alternate sources of income, improving agriculture practices and maintaining an ecological balance are the key aspects we have been trying to work on. The focus is on holistic development since all aspects are inter-related: rule one out and the development will be skewed. For example, if we are able to introduce the perfect educational institution but the child going to school suffers from health issues due to intake of contaminated water, or has no food in her/his stomach, what good would that institution be? Development needs to be holistic and should carry a long-term vision, which is the target I set out for my council and myself. It initially wasn’t easy but my village now recognizes, accepts and respects that vision and our form of functioning. As a woman, specifically, it is a lot easier to be inclusive and it is perhaps for this reason that apart from women even the youth and children very easily share their challenges, concerns and dreams with me. In the future, do you have any plans as to what you could do with the experience gained as a Sarpanch? Chhavi Rajawat: I hope to be able to steer some policy changes for the grassroots. A bottom-up approach is what we need, ensuring that the villagers are made the key stakeholders for the government schemes or any form of development to have a real impact. I am glad that the State Government has recently chosen me as a resource person for capacity building. I would like to participate more actively in the process and assist as many Sarpanchs as I can. Do you have any thoughts on the steps that should be taken by political parties to promote women’s participation in governance and politics at the grassroots level? Chhavi: Reservation is certainly necessary for women’s participation in politics in India. The fact that it has taken so long for that to happen proves its importance. However, for women to take active leadership roles, training and initial handholding is necessary especially to combat hindrances such as ‘stays’ levied by the likes of the Sub Divisional Officer/ Revenue Appellate Authority/ the local courts, etc. Education sure helps and I wish our leadership would take that seriously: at the grassroots, if men play the proxy role it is understandable because they feel the need to protect their respective women – many being illiterate and documentation being critical. You sign one wrong document and you don’t know what case will be lined up against you. There are many who take advantage of the ignorance of the elected representatives, beginning with the Panchayat secretaries and Patwaris. Are parties serious about it? I don’t know. Announcing something and having the mindset to drive change, I feel, are two very different things. One has to ‘feel for the cause’ to translate it into anything meaningful and that can only happen if the entire chain adheres to it. The perceptions and attitudes our society has towards our women in itself answers the question. At large, I think political leadership is still lacking as far as promoting women’s rights are concerned. Are we ready yet? The perceptions and attitudes our society has towards our women in itself answers the question. At large, I think political leadership is still lacking as far as promoting women’s rights are concerned. What are your suggestions for women who want to make it big in life but find it difficult owing to patriarchal pressures and social norms? Chhavi Rajawat: What one thinks of the glass ceiling, its thickness and its very existence lies in the hands of the individual. One’s self-confidence and faith can help one cross that bar. In addition, staying focused is important. Many often lose focus by worrying about the end result. Continuing to walk one’s path and, purposefully doing one’s thing pays off. At the end of the day one’s work has the potential to speak for itself and, once people recognize that, they will tilt towards the individual paving that path. One just needs to have the patience and the perseverance. I on behalf of Integrated Congress of Women Entrepreneurs admire your inspiration of working at grass roots level to raise the socio-economic status of rural people. The Administration is really very very slow in developing and transforming the rural areas at par with the developed area. We are sure that under the able planning of Ms Chhavi Rajavat (MBA) to make SODA village as one of the model village on the World Map. I would like to request her to constitute as many Self Help Groups of SODA Ladies and let them link with industrial activities. A National TRUST Integrated Congress of Women Entrepreneurs will always help her in this matter. Ms Suchi Gaur can help us to establish a link. Your work is extremely inspirational to all women. I’m doing a gender based research; on “The political participation of Indian women and the hindrances in the way”. I would like to know more about your experience as Sarpanch. As one woman has to give answers to many questions once she decides to enter into the politics. How would I make contact with you? Very good interview. Congrats to the writer and the young Sarpanch! Vandana Bahadur Maida, The First Woman Sarpanch Of Khankhandvi Village In Madhya Pradesh.